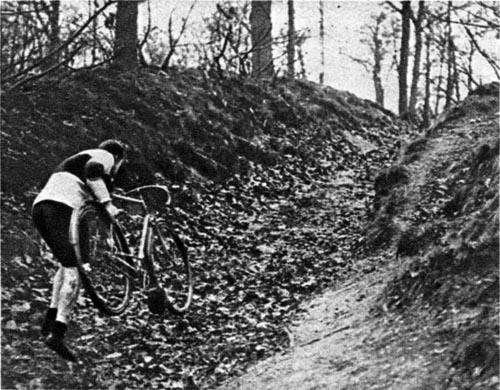 The popular French racing cyclist Eugène Christophe is a fervent participant in cyclocross. 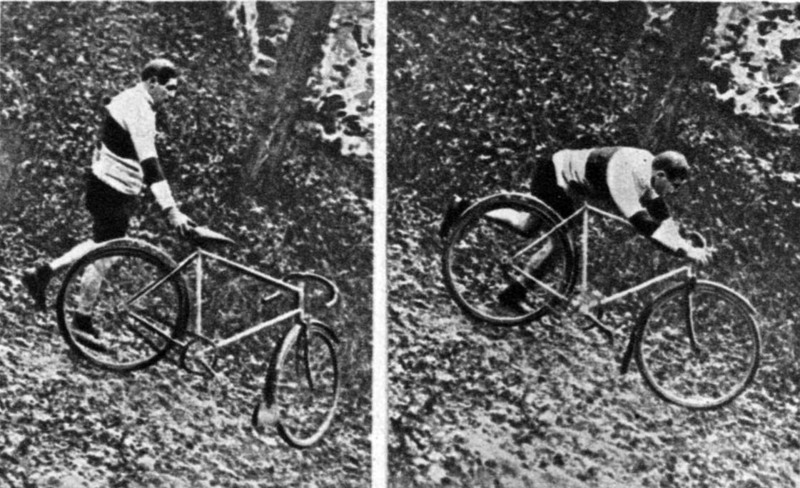 The French cyclocross championship, created in 1901 by our fellow Daniel Gousseau, was won six times by Christophe, in 1909, 1910, 1911, 1912, 1913 and 1914. That is enough to assert the experience and authority of the writer of the advice for young cyclists below. His advice will be even more heeded as Christophe regards cyclocross not as an end in and of itself, but as a mode of training for the road racing season : Christophe's successes in this type of racing are well-known. Need we point out his victory in Milan-San Remo in 1910, his second place in the Tour of Belgium in 1911, the Tour de France of 1912? Don't his wins at Paris-Tours and Bordeaux-Paris last year remain lodged in the memory of all sportsmen? Cyclocross is the physical education of the cyclist. I do not speak here about the cyclist who has acheived glory or even notability, about the champion who distinguished himself by fine exploits. I address the young cyclists, the beginners, the professionals and the amateurs, all those who love cycling and who love their bike as a horseman loves his horse, as a hunter loves his gun and his dogs. The first advantage of cyclocross is to teach the adherents of this sport to handle their bike, to not have trouble with it, in any case. I know remarkable cycling racers who have become famous either on the track or on the road, for whom the bike becomes a discomfort and a burden, as soon as they must dismount to cross a level crossing or a railroad freight car which blocks their passage. They are not familiarised with their machine; they do not know how to carry it, to put it down, to use it as a lever; they look clumsy and always seem to fear damaging their mount or fouling up. If they had ridden cyclocross, the bike would be a practical object for them. Second, cyclocross is a good method of training for the cyclist during the winter season. 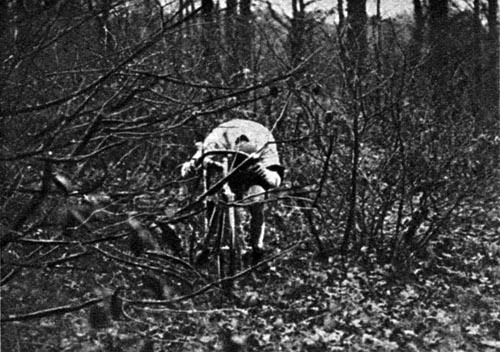 The professionals of cycling, who filled the long races during the summer, such as Bordeaux-Paris, Tour de France, or even simply the series of Paris-Roubaix, Paris-Tours and the circuits of provinces or departments, contracted, during painful races, a certain lack of flexibility of the limbs and the body; they are stiffened; they have tendency to develop a stoop; muscles, those of the wrist especially, are weak and soft. Cyclocross, a sport of short duration and much variation, is a refreshing exercise; it helps them to recover little by little in form, because it makes them work all muscles at the same time; it is raced sometimes on the bike, sometimes on foot; it makes its participants run or leap gymnastically in paths and impassable tracks and in plowed fields; it requires them carry their machine to cross barricades or hurdles; this corresponds then to weightlifting and demands equilibrium, suppleness, dexterity, stamina. It teaches the cyclist to descend on foot from hills, by slowing down and by taking the saddle of the bike under the arm, to not be pulled by the speed of descent and to prevent the bike from bouncing. 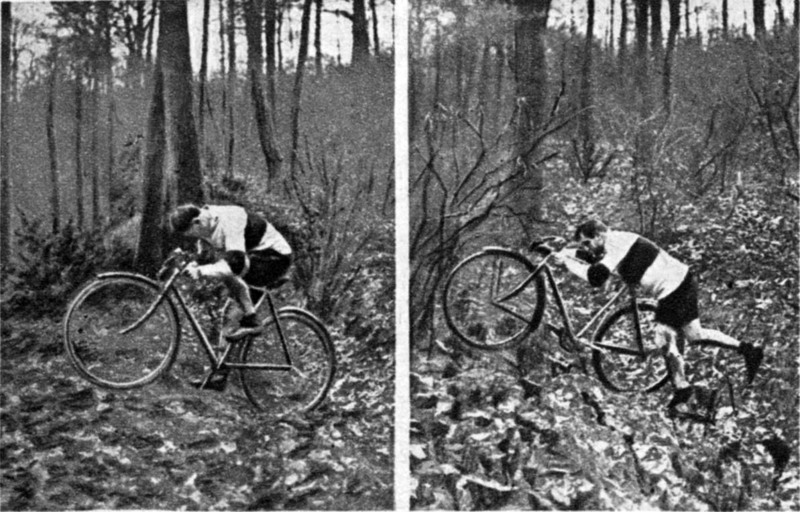 So the amateur of cyclocross executes different movements of lifting, leveraging, walking, running and jumping. For him, the bike is not an embarrassment, but an extremely valuable assistant. Did not I tell you that cyclocross is the physical education of the cyclist? Another advantage of cyclocross, it is that it does not last for a long time. A cyclist who wants training through the winter, for example, a fifty kilometre ride in two hours, is made to travel considerably away from his starting point, or where they left their spare clothes. If a small accident were to happen, they risk getting cold and getting sick. Cyclocross occurs in a confined space; the racers are always in the area; besides, they are always in action: when they are not cycling, they walk or run on foot; they must keep moving. 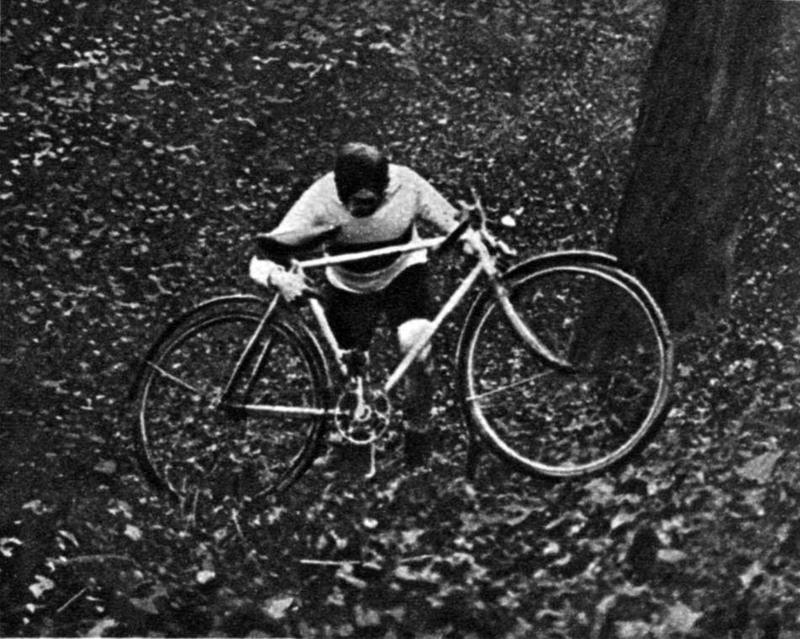 Many times I have heard the argument: "I have heard that cyclocross is fun and practical, but dangerous!" Dangerous, yes, but for the clumsy, for the daredevils. Never will a daredevil succeed in being champion of cyclocross! Can't they simultaneously ride quickly and remain careful? Compare the champion drivers who race at mad speeds and break neither their car, nor those of others, and the drivers of taxis who, in spite of their weak pace of 30 kilometres per hour, are a danger to the public! The first are masters of their vehicules, the others are not. Now that I have hopefully persuaded you of the interest and advantages of cyclocross, I would like to give you some advice that I owe to my own and long experience. A cyclocross racer draws a more or less large value from their aptitude to judge the terrain; the best racer is the one who reads the lay of the land fluently and surely, and who shapes his ride from this information. He will know how and when it is needed to dismount, to carry his bike above the plowed fields, to ride it on rough lands, to roll it on the front wheel with the saddle in hand on steep paths; he will see gutters and ditches in his path and will be able to either cross the obstacle on the bicycle, or descend with a bit of fancy riding and conserve his momentum to remount the still moving bicycle. Quick observation is a main quality of the cyclocross racer. The beginner imagines that he must stay on the bike at all costs, under the pretext that he will be faster on the bike than on foot. But he often confuses speed with haste, and while believing to be gaining time, he loses it, because he falls or because he damages his machine. One should also not take the opposite course to what I have described, and run like a cross-country running specialist. 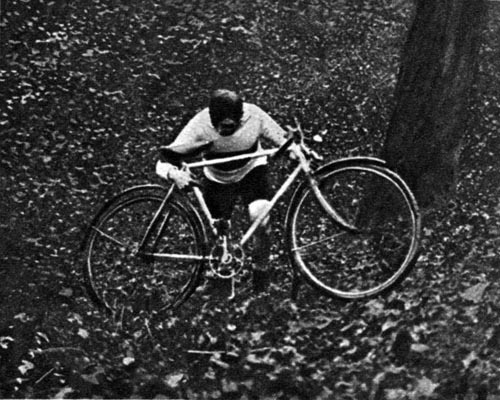 A cyclocross racer makes use of cycling and running interchangeably, as its name ["cross-country cyclo-pédestre"] indicates. However, a runner will not succeed in cyclocross: I need only name as examples the fruitless efforts of two fine professional cross-country runners who had believed that thanks to their racers' qualities on foot, to perform well in the sport which I represent. The cyclist can use his racing bicycle with tubulars in cyclocross: it is advised, nevertheless, that he reduces his development to 5 metres or 5 m. 20, which is, I assume, 5 m. 50 in the summer. Why this reduction of gearing? Because after a run or a hard walk, muscles are tired, and because development always seems bigger than actually it is. The freewheel is not recommended, if only for the positioning of the pedals when one wishes to remount. What I have just said looks like a detail, however, it is to a detail of this type that I owe my win over Tribouillard, in the 1911 French cyclocross championship. My redoubtable and valiant adversary, who made light of me in training, was remounting at the same time as me, at the top of an steep climb; he was on my wheel. I heard him grumble; I risked an look behind me and saw that he was losing contact with me while trying to get into his pedals; I seized the opportunity to increase my effort and lead; I kept them through the end of the race. 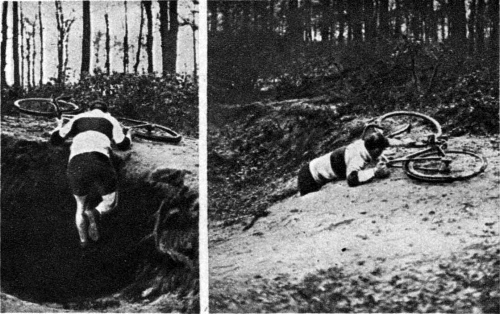 The beginner must also avoid remounting too quickly at the top of a climb; he may sometimes believe to be on a descent or the flat, while the slope still inclines at 3 to 4%; he exhausts himself in vain and gains no time. Regardless, as soon as one has remounted, it is necessary to make very strong turns on the pedals, to regain speed and be in a position to recover well in the saddle. A last bit of advice: of caution. Always have brakes - good brakes. Use your brakes, not only while riding, but also in descents on foot. Watch out for the slightest irregularity in the landscape, for the slightest clod of earth, for tufts of grass, for tree trunks. 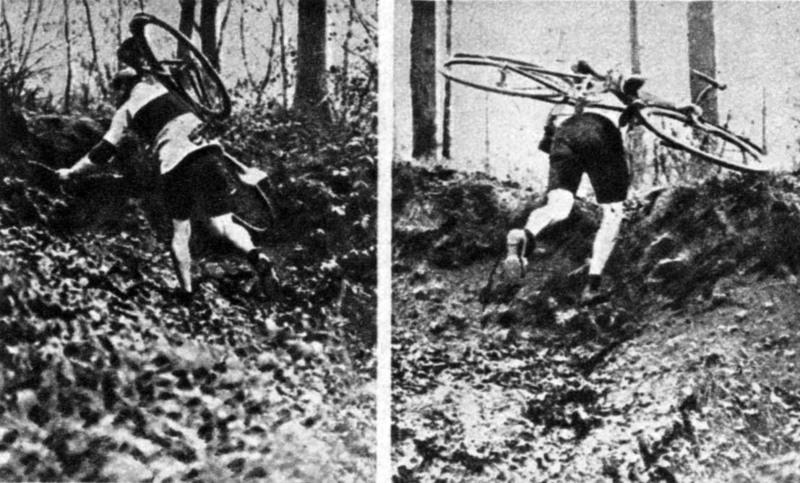 Be wary of ruts: I tell you that, recently, in the cyclocross of Choisy, on frozen ground, I took a superb flip after my wheels got caught a small rut, hard as a rail. Be careful, but also decisive. A cyclocross racer should not be a fanatical specialist, but it is essential that they know their business well if they want, one day, to be a champion. Anyway, one should ensure that cyclocross remains an exercise, training, without ever becoming overwork. And when the road racing season arrives, one will notice, to their pleasure, that their bike seems lighter and their pedaling smoother. - But, you will say to me, you address only the professional cyclists; you give them an occupation, an entertainment, a means to dispel inactivity and of training for the coming season; you deplore the scarceness of professional cyclocross racing. All that is very well. However, will you not address the amateurs, those who like cycling and who ride in the guise of recreation? - Here, I shall answer that you preach to the choir. For a long time I have known that the general public's interest in cyclocross will attract more audience than the fifty passers-by and curious who attend our starts and finishes, that amateurs will definitely wish to participate in this easy and quite variable sport. The public will begin following the competitors; it will realize that the race is engaging and eventful, they will have a good time; the time will fly past. It is impossible that it will not develop a taste for it; it will follow other races. 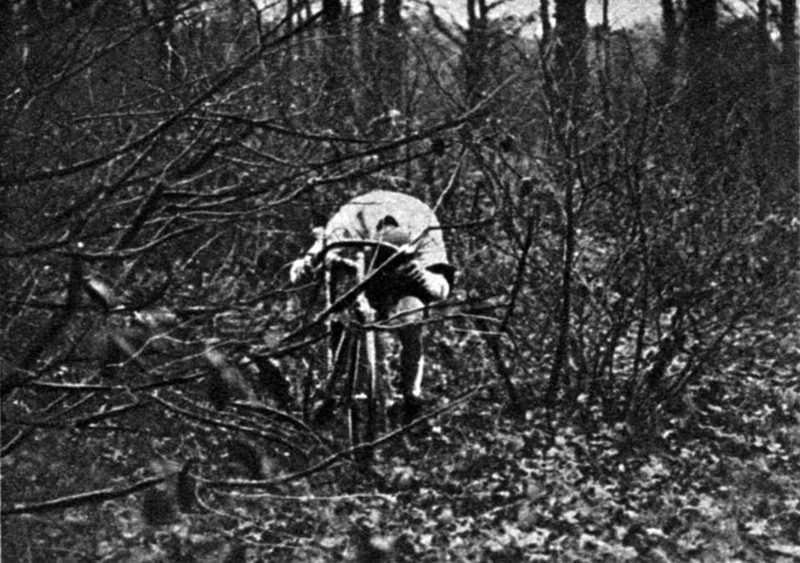 And, as well as people who like like to sometimes leave the road for quieter and less dusty tracks, also the amateur cyclist, enticed by cyclocross, will no longer content himself with riding up and down the monotonous and trafficky road; he will ride through the thicket as easily as the pedestrian, he will learn to handle his bike and he will see that he can pass untroubled everywhere a pedestrian ventures. He will understand that a bike should not necessarily follow the road as a train follows the railway. His admiration and love for the bicycle as a mode of locomotion, can only increase following such experiments. Participate in cyclocross; encourage your friends to participate; popularize it around you. There is another means to augment the popularity of cyclocross: it consists of creating new races. The number of cyclocross races appears quite small and there is a feeble quantity of racers when we compare the amateurs of cyclocross with those innumerable cross-country runners! I feel no animosity against the youth who participate by the hundreds in foot races in the Saint-Cloud woods; however my old cyclist's heart would be delighted to see a party of these beginners coming to our camp, with all their ardour and sportmanship! This article is quoted in its entirety from the 20 Jan 1921 issue of Le Miroir Des Sports, a popular French sports weekly of the day. 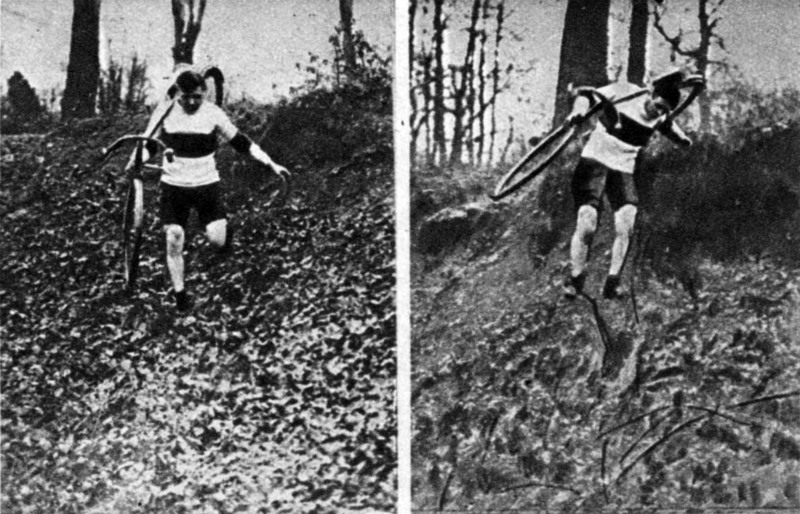 There are some quite notable differences from modern cyclocross in the then relatively new sport - primarily the much stronger similarity to cross-country running (thus the name "cross-country cyclo-pédestre"). Embankments and thickets such as those Christophe offers pictorial advice on are rarely, if ever, found on a modern cyclocross course, but at the same time, the bicycles have changed dramatically as well - there are adherents to fixed-wheel and single-speed cyclocross bicycles, but fenders are indeed a rare thing. If you feel the need to critique my ham-handed french translations, look here. Let me know if I've gotten anything horribly wrong!